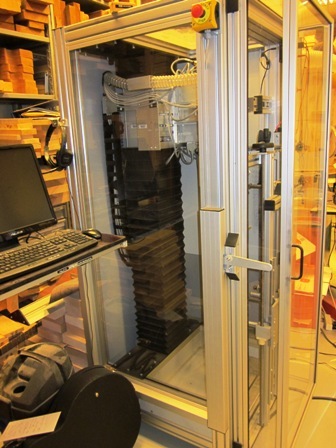 Haar guitars and parts is the first in the Netherlands to have a plek machine . Here you will find all information about the possibilities with our plek services. It’s a situation any guitarist can relate to: the instrument is well-balanced, looks great and sounds excellent, but somehow it’s hard to play. But it’s a problem that can be solved. 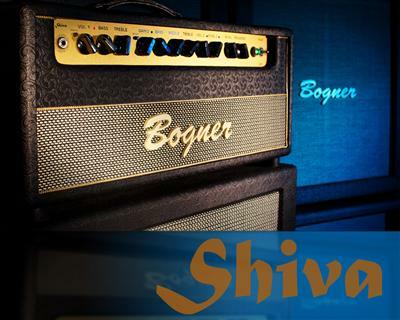 Next to the tone, the playability is one of the most important characteristics that determines the quality of a musical instrument. The plek process guarantees the best possible string action for each instrument, matching the individual style of the musician. A guitar with optimised playability just sounds better: the strings do not strike the frets during playing and any intonation problems that may occur due to too low a string action are eliminated. the instrument is well-balanced, looks great and sounds excellent, but somehow it’s hard to play. But it’s a problem that can be solved. Let’s take a look at the guitar neck. 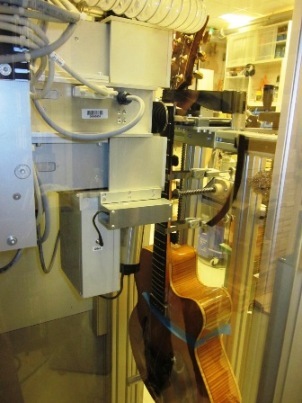 It is important that the guitar is under string tension and in playing condition when measured. The computer ascertains a 3-D like graph of the fretboard surface, including the position and height of the strings. Thanks to the plek scan the relief of the neck created by the string tension is taken into account while calculating the process parameters. In the Virtual Fret Dress menu the operator can not only determine how much needs to be cut off from each fret but can also set the fretboard radius and amount of fall-off suited for the instrument or player. You can see the height of each fret, how high each fret will be after processing as well as where fretboard buzz occurs because of frets being too high or too low. 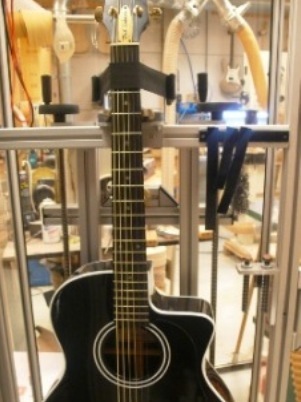 The first step would be to adjust the neck relief with help of the truss rod. When all the parameters for processing are set, the plek operator takes off the strings and starts the processing procedure. Depending on what parameters were entered, the frets and nut will be cut as well as the saddle on acoustic guitars. With the new generation of plek Machines (plek pro, plek station) the frets are cut, on its predecessor (plek basic) the frets are ground. The fundamental concepts and the control software are essentially the same. But although the basic achieved the same level of quality as the pro and the station, the fretwork process took longer and nut work had to be done by hand. 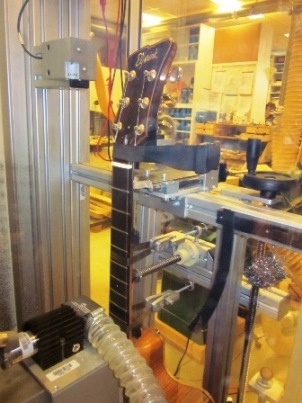 When frets, nut, and saddle have been processed, the instrument is strung up and tuned. The final scan checks to see if the result corresponds with the set specifications. If that is the case, then the process ends with the frets being polished to a high gloss finish. Ash, Bryan Adams, Beastie Boyz, Jeff Beck, Blur, Jon BonJovi, David Bowie, Terry Britten, Gary Brown, Jackson Browne, Bush, Larry Carlton, Johnny Cash(†), Tracy Chapman, Eric Clapton, Elvis Costello, Counting Crows, Death Angel, Tommy Emanuel, Bela Fleck, John Fogerty, Peter Frampton, Jerry Garcia, David Gilmour, Scott Gorham, Green Day, Sammy Hagar, Emmylou Harris, Hans Hartmann INXS, Uwe Kropinski, Little River Band, Hank Marvin, Paul McCartney, Rick McPhail, Metallica, Pat Metheny, Gary Moore, Mike Oldfield, Jim Olander, Prince, Chris Rea, Uli Jon Roth, Joe Satriani, Neal Schon (Journey), Silverchair, Stereophonics, Steven Street, James Taylor, Pete Townsend, U2, Bob Weir, Wolfmother, Angus Young, ZZTop, …and many more!.